I recently took up an interest in Clif Bar energy bars and started trying out some of the different flavors. I did a little research to get an idea of what some of the most popular flavors tend to be, but ultimately wanted to try them out first hand to decide which flavors were the best. So far, I have tried most of the flavors I have been able to find in store. There are still a few seasonal flavors and more rare flavors that I have not tried, but here is a recap of my favorites so far. After trying many different flavors, my favorite has to be the Cool Mint Chocolate. It tastes like mint chocolate chip ice cream but in energy bar form. Sometimes when products try to add mint to their flavor, it ends up tasting artificial, but with the Clif Bar, they got it right and it has a refreshing taste that is also sweet and savory. I highly recommend this flavor if you are a fan of mint. It's hard to go wrong with chocolate flavor and with the Chocolate Brownie Clif Bar, they did a good job getting the flavor to be quite tasty and still have a good level of nutritious qualities. If you like chocolate, this one should be near the top of your list of flavors to try. This is a newer flavor and I would have to say it is one of my favorites, coming in at the number 3 spot. It has the banana flavor which makes it kind of unique and different compared to many of the other flavors and energy bars in general. It also has the savoriness of the peanut butter and chocolate which compliment it nicely. This one is another one of my favorites and tastes a lot like oatmeal raisin cookies so if you are a fan of oatmeal raisin, definitely give this one a try. The most classic flavor. Overall good taste and something you can eat often without getting too bored of it, but not as interesting as some of the other flavors. The freshest Clif Bar I have tried so far. I liked the sweet frosting-like pieces and overall flavor, but found the carrot pieces to be a little hard to chew. Another unique flavor and good taste, but this one I would only want to eat once in a while, not necessarily on a daily basis. Other flavors I have tried which I thought were just ok include Crunchy Peanut Butter, and White Chocolate Macadamia Nut. 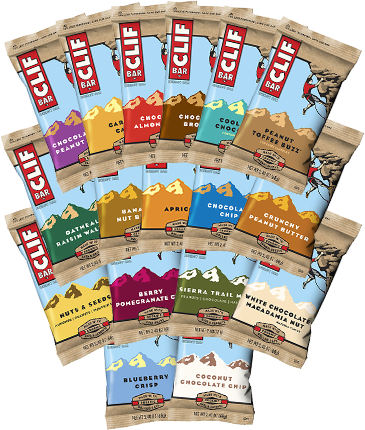 In store you can usually find Clif Bars sold individually and sometimes in 6 or 12 packs of individual flavors. It can be hard to find variety packs in store but they can be ordered online as a way to try out many different flavors. I will update this article in case I try any of the other flavors soon. Which is your favorite Clif Bar flavor? Feel free to leave a comment below. I have started trying out the nut butter filled Clif bars and I must say I like these even better than the regular Clif bars. The nut butter filled bars are a bit more interesting because they have the filling inside. They usually have peanut butter, almond butter, or a mix of cashew butter depending on which flavor you get. My favorite is the Coconut Almond Butter flavor. Usually I don't really like coconut, but with these, the coconut flavor is not overwhelming so it works. It has a nice savory taste with the almond butter. It's not overly sweet, but has enough sweetness to give it a good flavor. I highly recommend checking these out if you are looking for a new energy bar to try.